So Art Club are you looking for something to fill the many hours of free time you'll have this summer? How about picking up a great book. I know you all love to read as we've discussed at meetings. Here are some art-filled novels that might amuse you during the next few months. Let me know if you read any of these and we'll chat about them in the fall. Happy Summer and Happy reading! Thanks for your help setting up the Barnes and Noble Art Show. Everyone loved the exhibit. You all did a great job. I am out of town and also having surgery so the schedule will be a bit weird the next few weeks. Please see below for what we have left for the year. We will be meeting on the following schedule over the next few weeks. Wednesday 4/30..................Meeting 3-4:30 Grouting Tiles, details on glass blowing and Nursing home field trips. Wednesday 5/7.....................Meeting 3-4:30 Grouting Tiles, details on glass blowing and Nursing home field trips, finish grouting tiles. Open Studio if completed. Wednesday 5/14..............Open Studio PERMISSION SLIPS DUE and money due for field trip to Glass Blower!!! Thursday 5/29...............Final Meeting; Field Trip to Glass Blower and party at the place. Meet in art room 114 at 2:00. You will be excused from your B4 class at that time. Art Club Did An Outstanding Job!!! Tile A Mile Was a Huge Success.....THANKS TO ALL! We raised a little over $2000.00 for Tile A Mile this past Saturday, March 1st. It was really fun and your hard work paid off in bringing the event to a successful conclusion. Thanks so much to you and your parents for contributing to this event either by volunteering, baking or donating water. All were appreciated. Art club has been frantically preparing the old art room desks for painting. We have to sand, wash and gesso every desk before it can be painted. The room is whirring with the noise of sanders! Power tools rock! The next step will be to paint the desks, which will be auctioned off at Tile-A-Mile on Saturday, March 1, 2014. For a flier on the event click here. Art Club celebrated the holiday season with a party, white elephant gift exchange and an interactive reading of The Grinch! 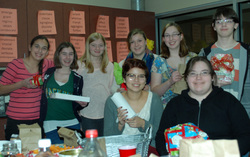 We had a lot of fun while enjoying some great treats and the camaraderie of the group. Merry Christmas and Happy New Year to All! Art Club Schedule for December and Beyond! Art Club Has Been Busy!!! Enjoy some photos of the Art Club's recent work. We've been meeting extra days to complete the Best Buddies' mural for the Friday, October 25th deadline. Next week we will celebrate our work so far with the Halloween party. See news to the right for details on the party. Congratulations to the newly elected Art Club officers. Kelly Kempen will serve as President, Sarah Calderone as Vice President, Jenna Anderson as Secretary and Hope Zimmerman as photographer. It will be great to have leaders for this school year. Thanks to all who ran. Great job with speeches and organizing our early activities. On Wednesday September 25th the Art Club visited River Hills West Nursing Home in Pewaukee, WI. to honor Alzheimer's Awareness Month. Students assisted residents in a watercolor painting project. We used rubber leaves and made printed stamps of the leaves. We also used sponges to paint designs. The works created by the students and residents will be made into greeting cards for the families of the residents or the staff to use. Thank you so much for bringing the students to River Hills yesterday. Our days can be challenging at times, and it is so nice to see a smile on their faces. You and your students are true gems for helping us brighten the day. Hope to see you soon. We will be awaiting the tile a mile event. Art Club thanks so much for a fantastic year! Your glass sculptures from Square One Art Glass will be here on Monday. Make sure you stop by the art room 114 to pick them up. You have been a great group to work with and I really appreciate your positive attitude and contributions to the Pewaukee Community. Have a wonderful summer! Pictures will be posted soon of the field trip. Check them out here. Wednesday 2/26.....................3-4:30 Meeting work on desks if needed. Friday 2/28.....................Bake Sale Items Due!!!! SATURDAY MARCH 1ST TILE A MILE ALL HANDS ON DECK!!! SIGN UP FOR A SHIFT OR WORK THE WHOLE THING. 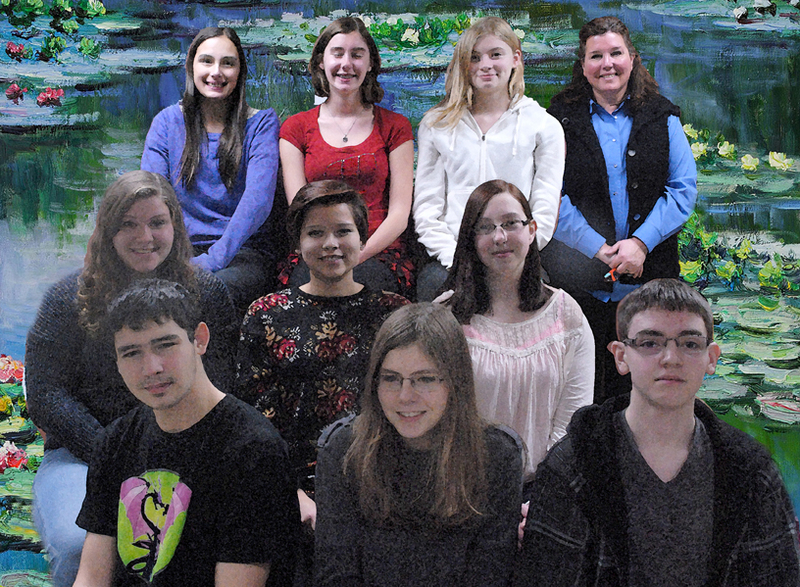 Wednesday 3/12.................Meet at Barnes and Noble Brookfield Square to Hang the K-12 art exhibit. Please arrange your own rides, carpool and get there by 3:15!!! Lots of help needed!!!! Art Club get ready for October. We have a lot to do this month. 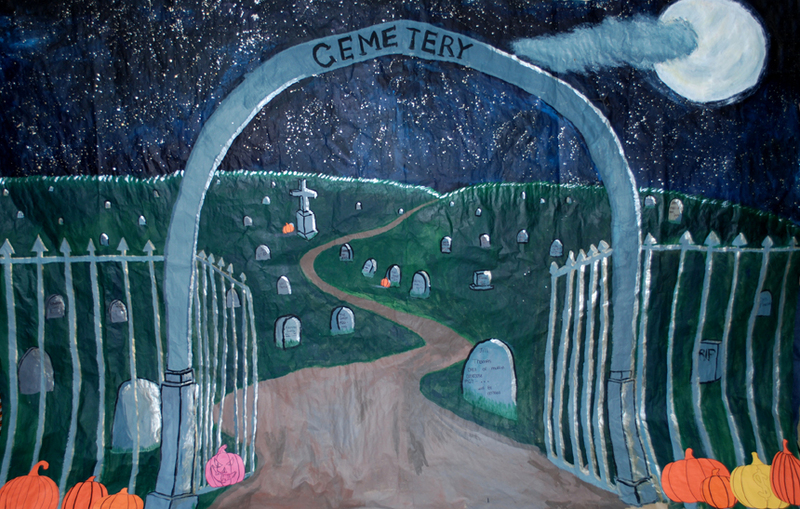 The Best Buddies have asked us to design a mural as a backdrop for their Halloween Dance. Ms. Bosanec and Mr. Van Hulle want us to design a word wall as part of the Auditorium hallway, showing all the plays that have been performed at PHS. We also should plan a Halloween Party too! So make sure you're here in October. 10/22........Tuesday Art Club this week. 10/24........Thursday art club if needed to finish our mural. 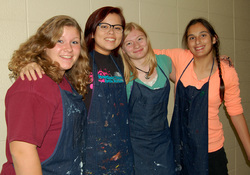 Art Club is open to students in grades 9-12 who love art and are interested in community service related to art. Art club will meet on Wednesdays from 3:00-4:00 in the PHS art room. On September 3rd look for Art Club at the extracurriculars tables set up during lunch. You will have the chance to get hand outs and talk to some of our members. We will have an informational meeting on Wednesday, September 11th from 3:00-4:00. You will have the opportunity to learn more about the club and hear from upper classmen who have been members. Bring your application for membership to this meeting along with the $15.00 fee. Checks can be made out to PHS ART CLUB.